How is it our political and social problems never seem to get solved? We’re in a Quantum Age using Industrial Age thinking—and it’s not working. by taking a virtual quantum leap beyond old limits and outdated ideas. Not just an innovative or clever idea. It’s an entirely different basis for thinking. We all know it’s time to think in a new way. But how do we do that? Dianne Collins shows us the way. it’s an essential body of knowledge being revealed at the perfect time. Dianne Collins sees the world in a different way. Do You QuantumThink? and it’s being hailed as the missing link for our changing times. Now you, your listeners, viewers and readers can have the ultimate paradigm shift that affects personal, professional and global areas of your life. From politics to prosperity to peace of mind, QuantumThink is transforming, optimistic, and life-enhancing! Political Gridlock—Let’s QuantumThink our way clear. The Company Mind—yes, every business has one! How being “unaware” of it limits results, and how we can use the power of The Company Mind to step up effectiveness now. Yes, Your Technology Has Surpassed You — how technology changes the way we need to think. The Media and Your Mind—are they in sync? Spirit and Soul—why people are afraid to mention these topics publicly. 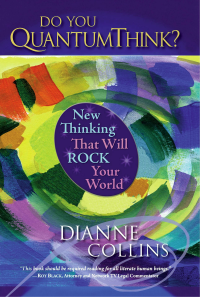 “When you master your mind, you master your life” is Dianne Collins’ mantra. Instantly free yourself of thoughts that stop you, stress you out or just plain bum you out. How is “new thinking” different than a new idea, and why we should care. Ease your mind and lighten your heart—making sense of our changing times by seeing the big picture: Context is everything. What’s “consciousness” got to do with it? The new buzz words: “quantum” and “consciousness”—the “great shift” “evolution” and a “time of unprecedented change” —what’s it all about and how do we deal with it? —FROM THE BOOK FLAP OF Do You QuantumThink? 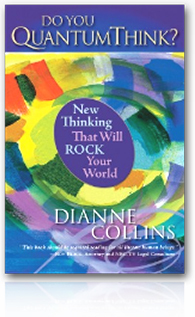 Dianne Collins is an original thinker and one of the foremost thought-leaders of our time. She consults with executives in the world’s leading corporations as well as enterprising entrepreneurs, celebrities, students and evolutionaries in the new system of thinking, QuantumThink. Her life is dedicated to people living spirited, joyful, and masterful lives through leaps in awareness and the expansion of their approach to reality. She is a master of translating ancient knowledge into modern “quantum” terms that provide a practical and transformative platform for the way we conduct our business and personal affairs. 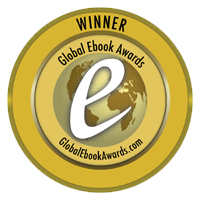 Available in Kindle, Nook, and iPad editions. The mission of Do You QuantumThink? is to help us take a quantum leap from the archaic industrial age thinking of our recent past, to apply as practical wisdom a new era of quantum age thinking that is holistically attuned to modern developments in quantum physics, technology, and spirituality. QuantumThink® is a proven system of thinking that has been presented and used successfully for the past fifteen years by executives and leaders in Accenture, AT&T, Chase Bank, CNN, DuPont and McKinsey, by officials and managers in the United States government agencies including the Federal Executive Institute, the Office of the Assistant Secretary of Defense, and the National Partnership for Reinventing Government under Vice President Al Gore; and by individuals of all walks of life around the world. 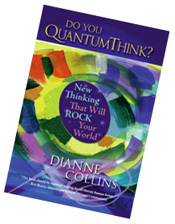 Praise for Dianne Collins & Do You QuantumThink?